Hello again, Today we’re going to install and setup TrueCrypt on Kali Linux/Ubuntu/Windows & Mac. This process is useful whenever you have sensitive information related to your clients and exploits or vulnerabilities which you wanna keep it secure then you need to encrypt these files. We’re sharing this tutorial for educational purpose only. 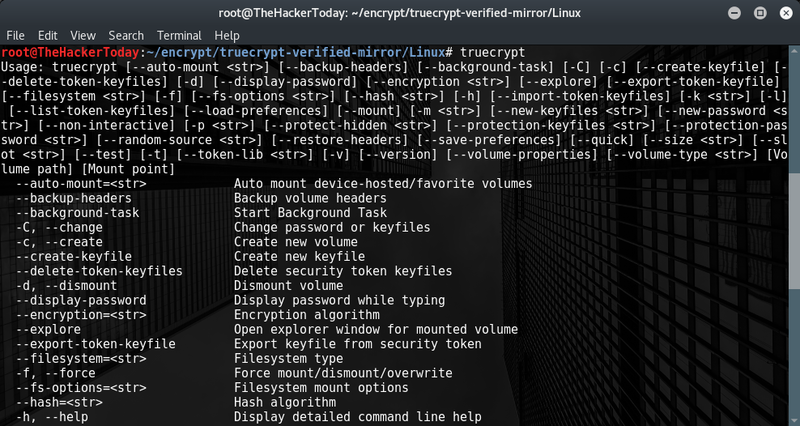 How To Install TrueCrypt Console Version in Kali Linux. Now it’s time to extract those files using tar -xvf command. After extracting the file now it’s time to run the setup. After that console version will be installed now its time to install GUI version for the TrueCrypt. How To Install TrueCrypt GUI Version in Kali Linux. When you run this setup a popup will appear with a following message. Click on Install TrueCrypt. Now you have to click on Create Volume. Select the Standard TrueCrypt Volume. The next screen will provide you with Encryption Options. Select Encryption Algorithm from the drop-down menu. There are several choices, but for regular purposes, AES (the default 256-bit key) will suffice. You will now be prompted for Volume Size. You should have a minimum size of approximately 1 GB, but this may vary depending on the testing regime. Click on Next. The next screen allows you to select Format Options. For Filesystem Options select FAT from the drop-down menu. Click on Next. Click on Format to create the TrueCrypt volume. The final volume has been created. It will appear as an icon on the desktop. The volume is encrypted, and it can be copied to an external storage device or moved to the host system and remain encrypted. If you double-click on the truecrypt1 icon, you will be taken to a File Browser view. At this point, it will act as a regular directory, and you can use the folder to store all of the test-related information. When you work with the contents of the folder, and wish to ensure that all data is encrypted, select Dismount on the main menu. The folder will revert to an encrypted state.